Look like a warzone, but it’s them who fired it to the people. Trying to disperse, what for? Let them walk peacefully to the stadium. Then people happy, but not. No, I wasn’t there at the Bersih 2.0 rally yesterday in Kuala Lumpur, but I have to tell you that I wanted to be there so badly but physically I am in my hometown. Even though I wasn’t there, my spirit was and is there always, to support a clean election and process of making a real democratic country. It’s just people, walking on the street, with no weapon. 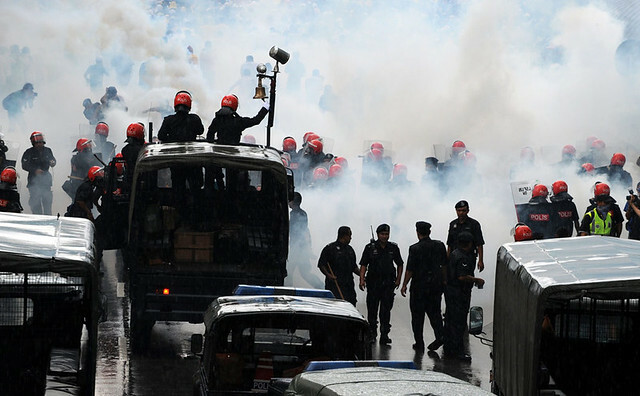 But the police force fired tear gas and water canon to them. 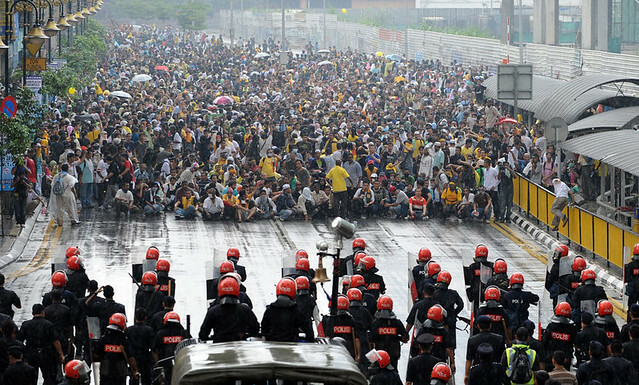 709, 9 July 2011, was a historical to the Malaysian citizen, it’s a day to be remembered in my opinion as people of all walks of life came together, unite and walk for electoral reform. It’s the government who stupidity condemned the peace rally. The keyword is peace, it’s not like the Vancouver riot, it’s not a riot, it’s a peace rally. 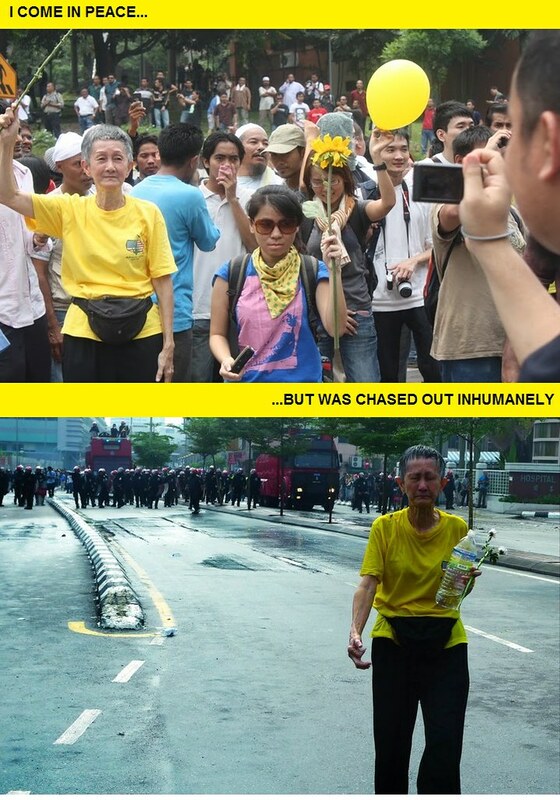 There’s no dangerous weapon, it’s just a peace walk to voice out the voice of Malaysian. 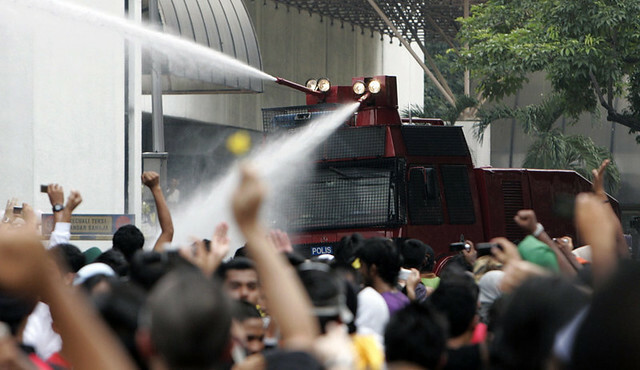 The government was being stubborn and keep saying that this Bersih 2.0 is illegal. What the hell is being illegal when people just want to walk on the street to voice out? It’s a planned peace rally, just walking to voice out to the King. If it’s illegal, then what’s legal? If the Election Commission, say OK with the 8 demands, then there will not be any rally and riot. It’s not demand for changing the rights of the Malays also, but you all crazy people just scared of the 8 demands and uses all ways to stop the rally from going on, but you failed. Not many turned up, but still it’s more than 20,000 people. 20,000 is a small number of the total population, but it represents a big part of it. If the government friend friend with the Bersih, shake hand, give Bersih a stadium, then there wouldn’t be any injury and running around the city. The traffic will be smooth and business as usual. But no, the government didn’t want to give the stadium and block all the road to KL, of course this will cause massive jam outside KL and business stops! Stupid road block is the cause of the disturbance of KL folks. And somemore, why catch people wear yellow shirt? What the hell is this? Why wearing yellow shirt is delivering a negative message? This is the super ridiculous and very gay and very pointless! 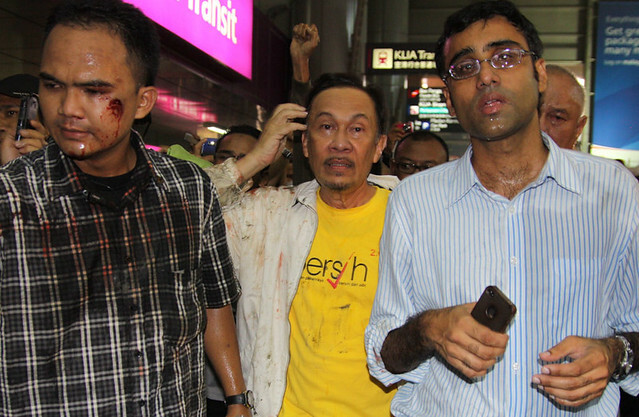 No way, DS Anwar’s bodyguard will be hurt so easily by just walking. Hit by canister? 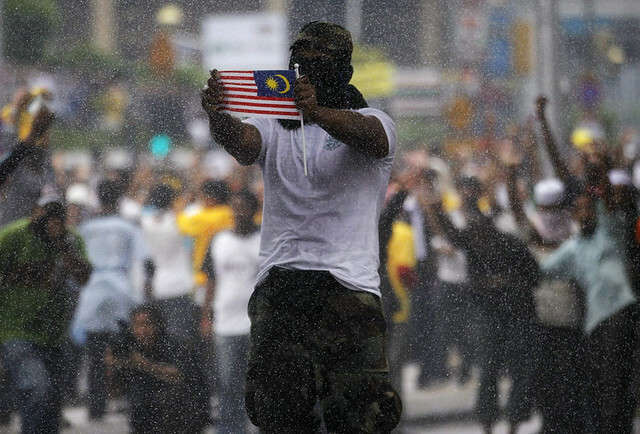 We, part of Malaysia, not whole, just want to show what we think on the street only and you shoot us like crazy with tear gas and water canon. It’s you, the PDRM who was being rude, aggressive and dangerous. 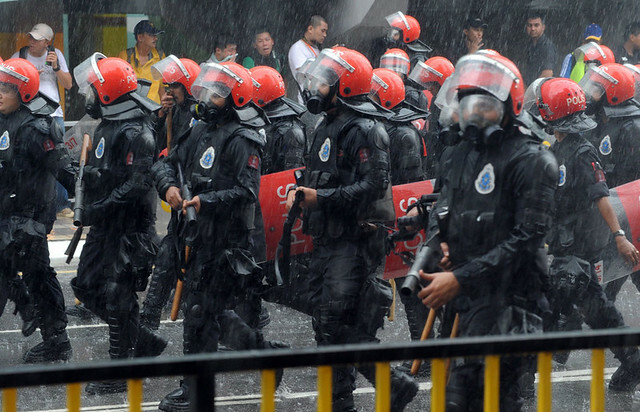 Malaysia is a civilized country, you think the Malaysian will fight? It’s not 1963 anymore, come on it’s 2011 and there’s no Malay, Indian or Chinese, it’s all Malaysian who took part in the rally TOGETHER! 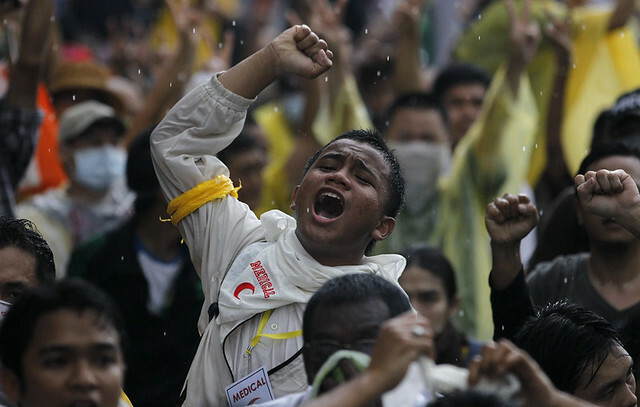 Bersih, might have political message, SO WHAT? If the government is clean and good, then what for you are scared of the rally and preventing it to happen and stop all the top leaders from entering the city? I don’t care of what the opposition is doing, but I only care about a real electoral reform for a fair and clean election. If you win it cleanly, I will keep my mouth shut for sure. Sad for the old aunty who came to support. Seriously, think about why people are joining the rally? People not joining the rally doesn’t mean they don’t care or disagree with it, why don’t you think about they concern, but just afraid of being caught? OK, they might be chicken, but I am sure they have the heart for it. Look at Twitter, the updates of Bersih, just look at the attendees, and the photos, it’s a true spirit of being unite together, all races, that’s the most lovely part of Bersih, it’s not PAS, it’s not DAP, it’s not BN, it’s not MCA, but it’s Malay + Chinese + Indian = Malaysians. One thing I very TULAN is when A Samad Said wanted to submit the memorandum to His-Majesty King, the police stopped him. He is a very old man already, and he has no melee weapon or gun or anything, why the hell the authority, the upper level of police don’t allow him to get through? OLD MAN + a few papers of memorandum, that’s all, they also don’t let them go through and talked so rudely. Come on, he is just an old man. Well, I write this hopefully won’t get caught (HAHAHA), I love my country, I am not fully disagree with the government, just some wrong doings of them, yet I am proud of being a Malaysian. Exercise your rights, register yourself for election at the nearest post office and voice out during the next elections. Malaysia Boleh! – 1 Malaysia!